Vinayak Bulk Movers Pvt Ltd. is a dynamic dry bulk transport company with a business approach as modern as its fleet. 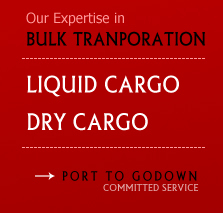 Our special expertise is bulk cargo movement. We have significant financial and operational strength – as well as a strong Domestic network. At the same time, we are known for our local knowledge and close client partnerships. Our domestic reach, coupled with the agility of a small company, allows us to tailor our services to specific client needs. Staff is quite humble, polite and dedicated to our Customer's service. Company is having bases & Branch offices, well equipped, provided with all the infrastructure located at various places in Gujarat & other places.